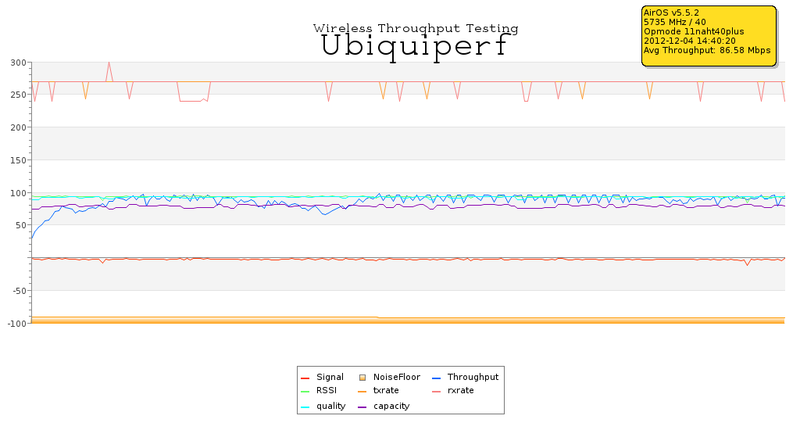 Despite having a handful of BCP design documents at hand, as well as input from established and respected members of the wireless community, the question kept seeming to pop up. So how does one present a worthwhile answer? My solution was to build a small section of a tower leg on our back lot using a non-penetrating roof mount, 2 Ubiquiti Rocket M5 90 5G-20-90 degree sectors (mounted 90 degrees from each other, without shielding), 2 Nanostion M5 CPE’s, 4 laptops, and a couple of inverters and car batteries to power 2 of the laptops (the other 2 were run off extension cables). 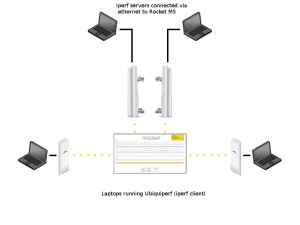 The two laptops connected at the Access Point side ran as Iperf servers, each laptop ran as a client. Plug this in here, that in over there, and this cable.. here. 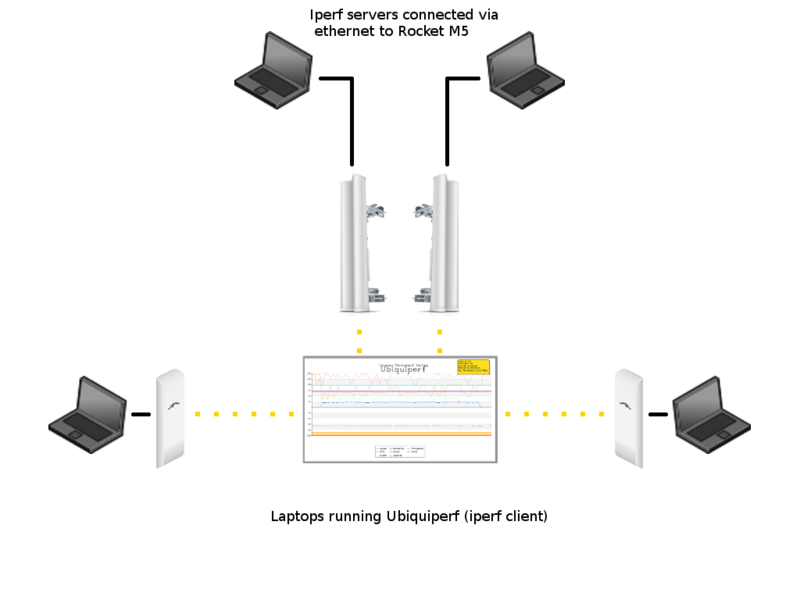 The thought was to grab Iperf and AirOS datapoints at every couple of seconds and see “what happens when I do this?” “THIS ” generally entailed doing something BCPs warned against doing. 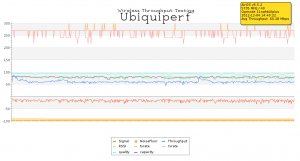 To gather the Iperf data and AirOS statistics, I put together a quick script i called “Ubiquiperf“. Basically it polls an iperf test every second, pulls the stats off the radio (Capacity, Quality, RSSI, etc) , generates a CSV file of all the data, and finally creates a graph using the jpgraph PHP libraries. Due to weather conditions our testing was cut short and our initial results had a simple problem: we needed to turn the transmit power down on all the radios. So what happens if I perform the same throughput test on both units but at the exact same time, over a longer duration? Well, it obviously cut off about 20Mbps from the first access point. Of course, the power on the radios really needs to be turned down so this test is unfortunately not worth much. We’ll be doing additional testing in the near future, and hope to have meaningful results that include mounts with and without RF Armor, Titanium model equipment, etc. I’ll publish our results when I can. In the meantime, feel free to play with it yourself. Full PHP source is available on GitHub.